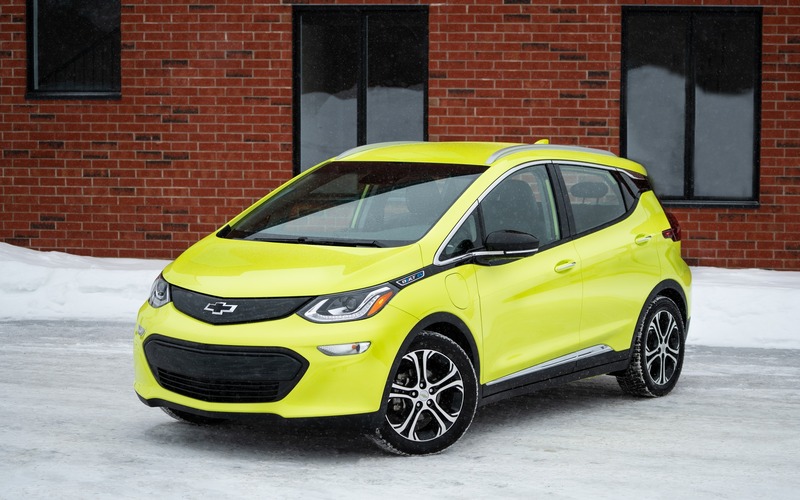 Two years after its official release, the Chevrolet Bolt EV remains competitive even if it now faces serious rivals such as the long-range Nissan LEAF PLUS and the Hyundai Kona Electric. Plus, the Tesla Model 3 is finally here, and it’s not only an accomplished product, its gaining quite a bit of traction with Canadian consumers. Yet, the Bolt continues to offer good bang for the buck because of its range-per-dollar ratio. It’s a car we quite like here at The Car Guide for its spirited character and ease of operation. Curious to see how it would perform in a bitter Canadian winter, we took one out in the middle of January. The key to be satisfied with your electric car, especially in Canada, is to have a high level of range at your disposal. Thankfully, the new wave of EVs offers just that. Several electrified vehicles will get in the vicinity of 400 km now. Some even lean towards 500 km. Tesla offers it, and so will Volkswagen once it releases its I.D. later this year. Slowly, but surely, electric cars are catching up to the freedom we’ve come to expect from gasoline-powered ones. In the Bolt, you get 383 km for roughly $45,000—before freight and delivery charges as well as applicable green-vehicle incentives. That’s more or less in the same ballpark as the all-new Hyundai Kona Electric, which will go up to 415 km on a full charge for roughly the same price. 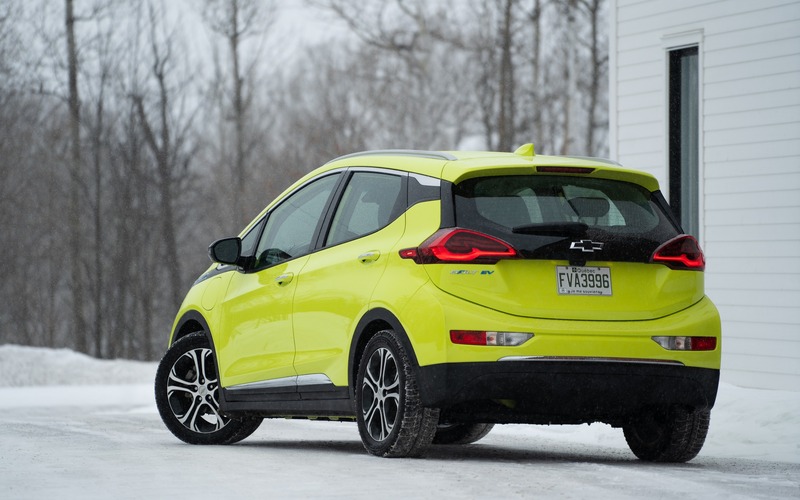 For 2019, the Bolt remains relatively unchanged, except for the addition of new colours like the love-it-or-hate-it Shock Yellow you see here. Slight changes were made the car’s charge-termination feature. It now offers selectable levels to decide when to stop charging, hence reducing charging costs for short trips. The touchscreen now incorporates separate buttons for air conditioning and heat. The transmission’s Low mode was also revised to prevent the car from moving when stopped and the seat belt is unbuckled. Mechanically, nothing changes, which means its battery is still a 60-kWh unit, allowing the front-mounted electric motor to develop a claimed 200 horsepower and 266 lb.-ft. of torque. It’ll do 0 to 100 km/h in approximately 6.5 seconds, which is not too far behind pocket rockets such as the Volkswagen Golf GTI and the Honda Civic Si. On paper, the Bolt allows you to drive it far without too much fear of running out of juice, or panic over the fact that you can’t find a charging point. That’s appealing. Besides, with Quebec’s Electric Circuit network, which currently offers over 1,000 public charging stations scattered across the province—all manageable via a free app on your phone—driving full electric in La belle province is far from inconvenient. But what about driving an EV in winter? Anybody who’s been in Quebec knows that January is the coldest month of the year. At its peak, temperatures will go down to a bone-shattering -40 degrees Celsius and can remain there days on end. That’s precisely when we had our Bolt press unit. One important element you need to consider when running these things in our climate, is that you’ll lose a fair amount of range, between 30 to 40 percent to be precise. That’s inevitable, and even cars with an internal combustion engine consume more energy when temperatures drop. But these cars have access to a refuelling station at every street corner and can refuel within minutes. Electric cars aren’t there yet. The morning we picked up the Bolt, it had just been disconnected from GM’s charging port. The trip meter showed a maximum range of 223 km, 160 km less than what Chevrolet advertises. After our 25-km commute, which required us to run the heater, rear defroster and heated seats, the same onboard computer displayed 173 km. Now, to GM’s credit, this happens to all electric cars. 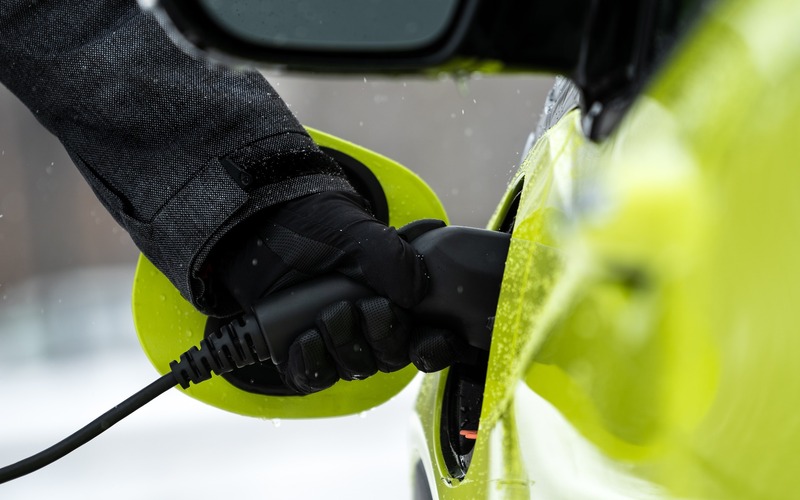 During the cold season, it’s important to keep EVs plugged in the moment you don’t drive them in order to allow the battery’s thermoregulation system to maintain an ideal temperature. Most EV owners get a home charger to do just that, typically a level 2 (240V) or even a level 3 (400 V) unit. GM does provide a 120V charge cord in the Bolt’s trunk. It’s handy for when all you have at your disposal is a conventional power outlet. But during such extreme conditions, that tiny cord is barely strong enough to provide heat to the batteries. It also takes a whopping 50 hours to fully charge the car. Unfortunately, not everyone has the real estate to install a home charger. Think people who live in apartment buildings and condo complexes. This is the case with yours truly. Luckily, I could rely on the Electric Circuit app, which told me there was a level 2 public station just 500 metres from my home at the cost of $1.00 an hour. Once connected, it would take my Bolt nine hours to fill up. But even though we made sure to always connect our EV to some sort of high-powered energy source, the Bolt never managed to get more than 225 km of range. We experienced something similar when we drove the 2019 Honda Clarity last November. Resetting the odometer to make sure we were driving the same distance the car had promised only revealed similar numbers. Range and charging times aside (the quickest we got was 50 minutes for an 80% charge), the 2019 Chevrolet Bolt EV remains a charming little car, and a rather impressive bit of engineering. That smooth electric motor is not only immensely quiet, it provides more than ample low-end punch to get this subcompact up and going quickly, making it rather fun to drive. And the clever little paddle located towards the left of the steering wheel causes so much regenerative braking, it’ll immobilize the entire car without even touching the actual brakes. There’s also an immense fair amount of space in there, considering its external dimensions. The rear seat is roomy for any adult, and once it’s folded flat, the Bolt will engulf 1,603 litres of your gear, placing it almost neck to neck with a Mazda CX-5 (1,687 litres). We were also impressed by how securely grounded the car feels due to its floor-mounted batteries. There’s virtually no body roll and it takes a lot to get the car unsettled in crosswinds. That’s handy during a snow storm. Unfortunately, we’re still not fond of the Bolt’s flimsy interior plastics and not-so-comfortable leatherette seats. That cabin looked and felt low-rent two years ago. Today, it’s straight-out unacceptable considering what the Korean competition offers for similar money. But there’s a lot to like here. The Bolt is fun to drive, rather quick, and cleverly priced. It even comes with its own bespoke infotainment interface, which, like the rest of GM’s systems, is easy to grasp, intuitive and filled with the latest tech, all while informing drivers of vital information such as which of the car’s accessories drain the largest amount of electricity, or for timing your next charging cycle. 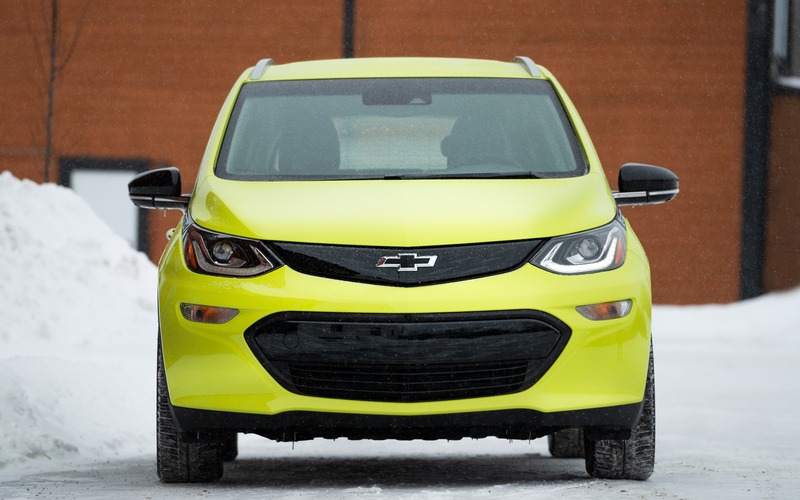 Even if it’s starting to show its age, the 2019 Chevrolet Bolt EV remains a competitive product that’s still relevant even with new electric kids on the block. As for running any current electric car all year in Canada, it’ll work, but you’ll need to be well equipped and have a bit of free time at your disposal. 10/10	With 383 km of total range, the Bolt EV will get you far on a single charge. 5/10	Those letherette seats are hard, narrow and not all that comfortable. It's the same issue in the rear. 7/10	That electric motor allows the Bolt to be quite peppy off the line, exhibiting near-hot hatch performance. 10/10	As with all GM systems, this one is clear, simple and easy to comprehend. Comes with Bolt-specific apps to better monitor battery performance. 8/10	The Bolt's low centre of gravity and ample torque make it a fun-to-drive little car. 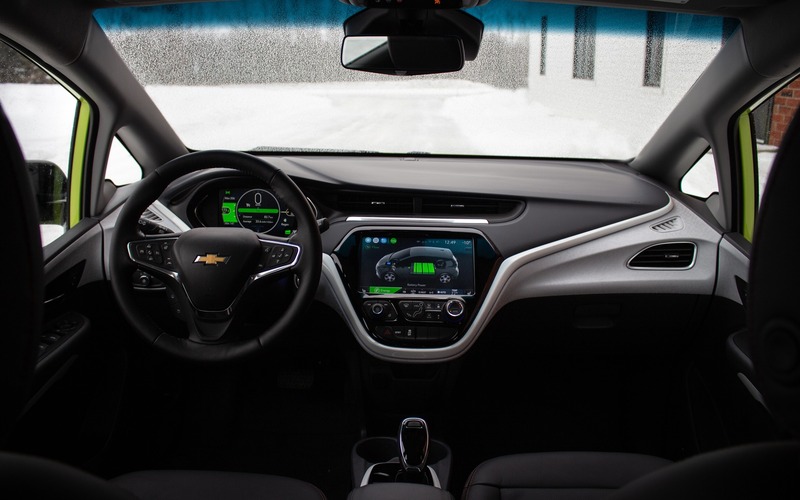 8/10	Even if it's been with us for a few years now, the Chevrolet Bolt remains a pioneer among electric cars thanks to its affordability, practicality, and more than ample range.